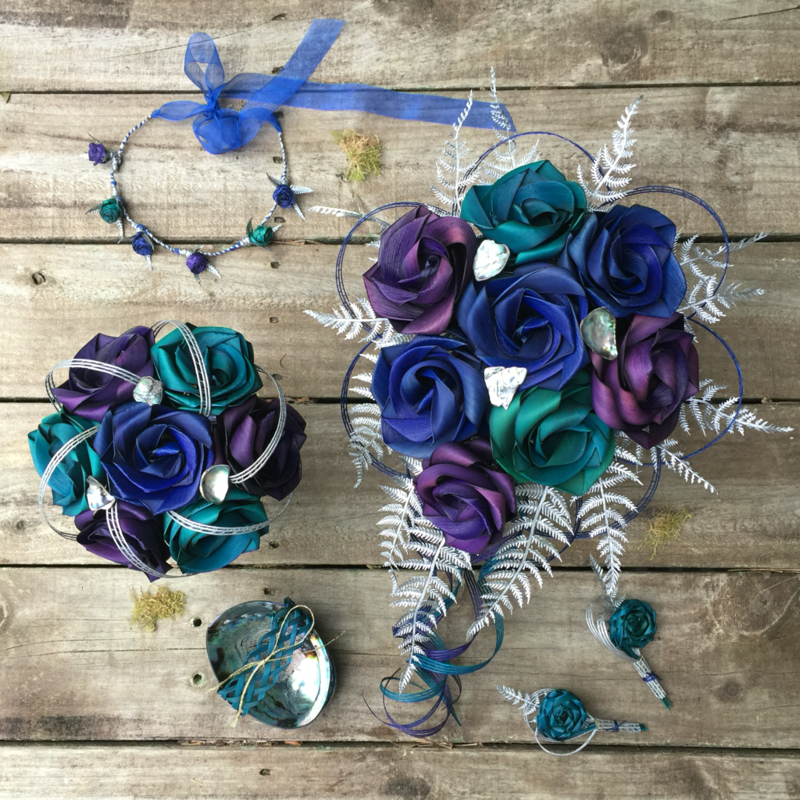 Blue Paua bridal bouquet in the waterfall style with silver ferns $190 NZD & the bridesmaids blue Paua seven flower posy with silver loops $90 NZD. 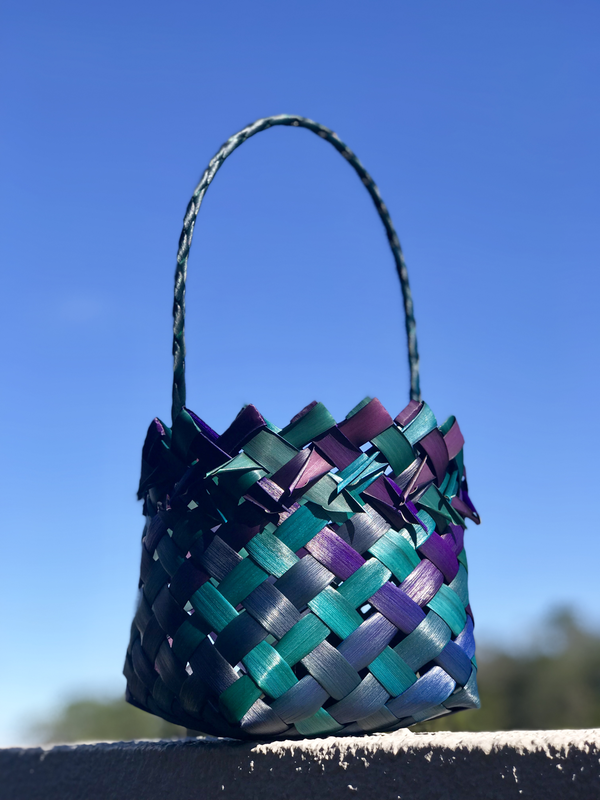 A brighter version on the paua colours with ivory, purple & turquoise with green ferns, koru, paua & wide purple loops. 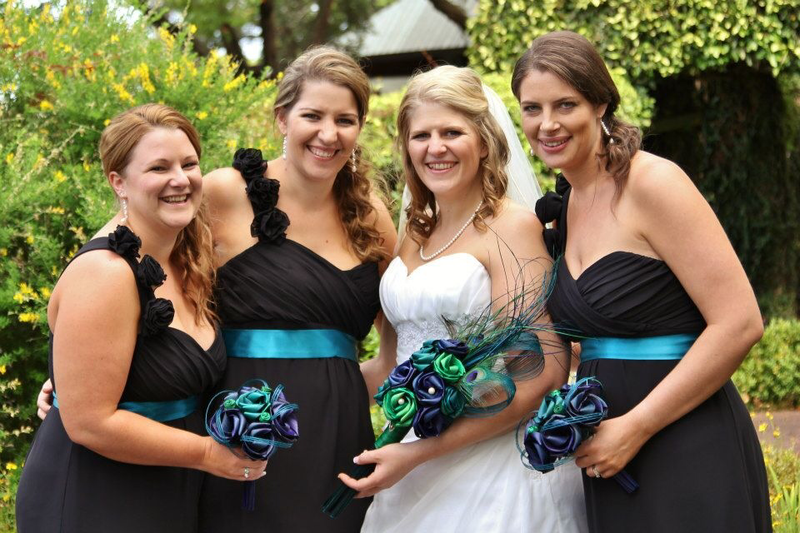 Brides waterfall bouquet $190 NZD & Bridesmaids matching posy $90 NZD. 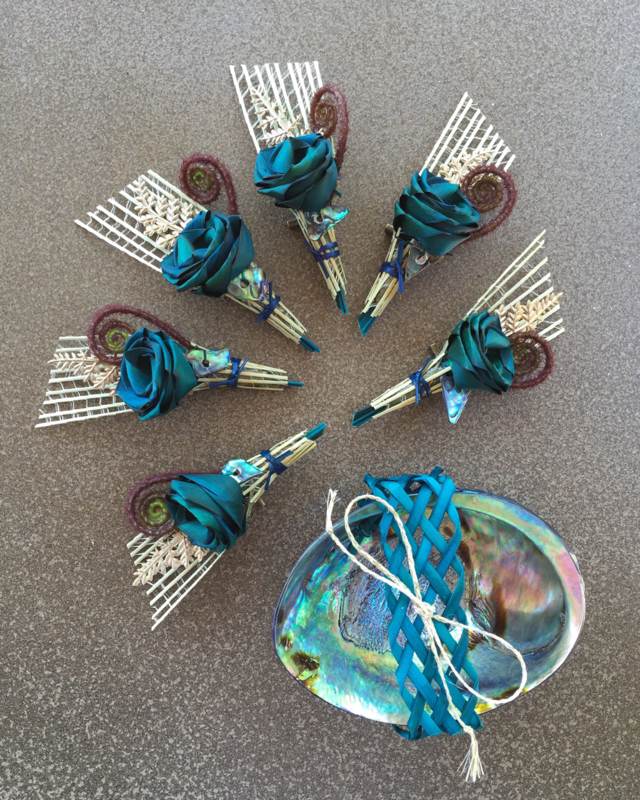 Men's Paua buttonholes in turquoise with silver fan backing & Paua piece $20 NZD ea. Paua order in Purple, turquoise & blue with silver fern. 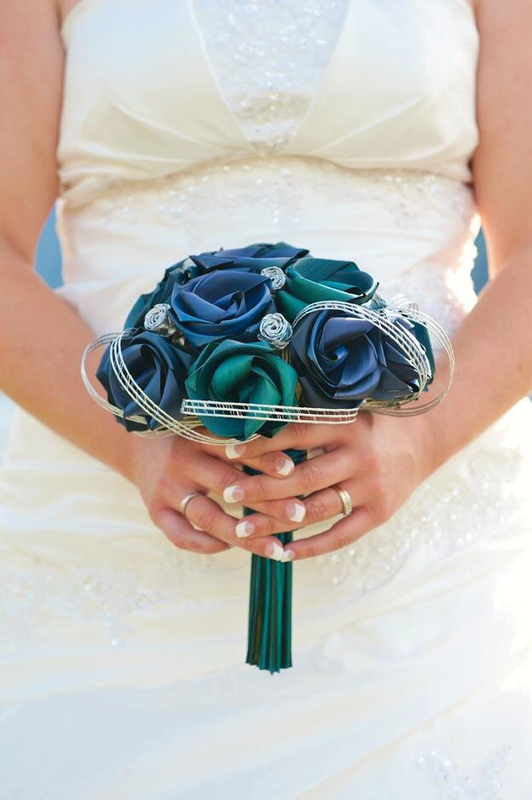 Waterfall brides bouquet $190 NZD. 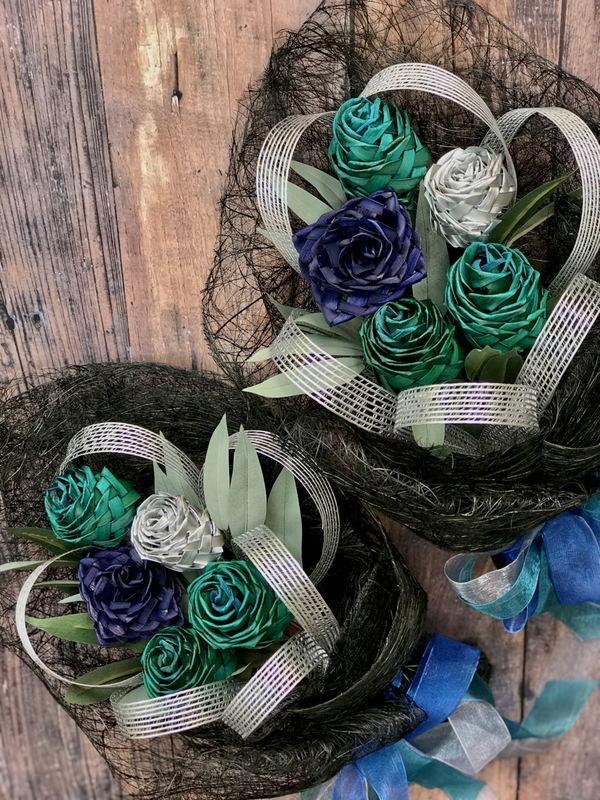 Bridesmaids Paua seven flower posy $90 NZD. Paua ring holder $50 NZD. 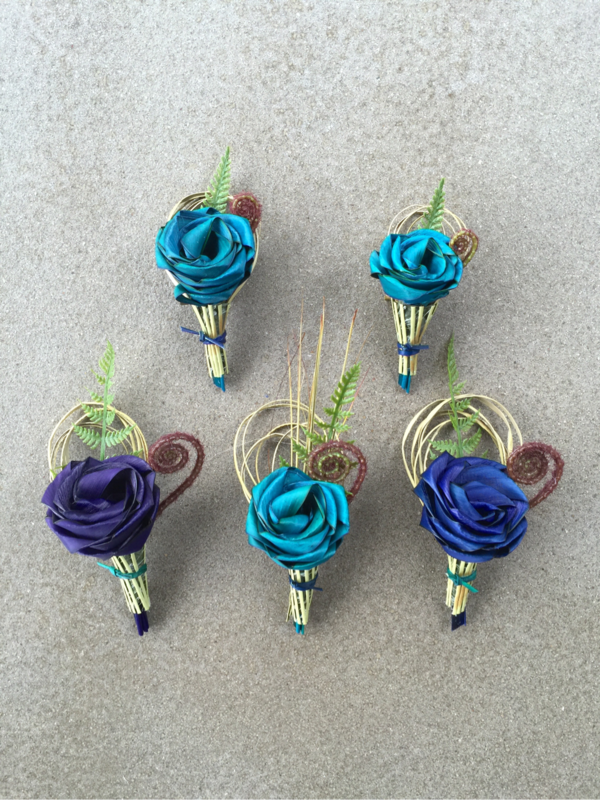 Woven koru buttonholes $25 NZD. Paua halo $40 NZD. Paua halo in purple, turquoise & blue with silver fern $40 NZD. 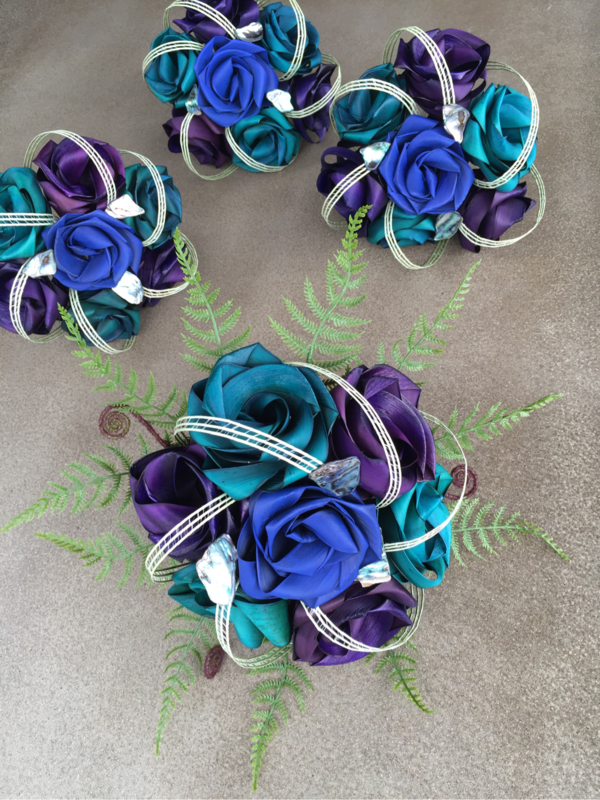 Paua waterfall bridal bouquet in purple, turquoise & blue with green ferns, koru & natural grasses $190 NZD. 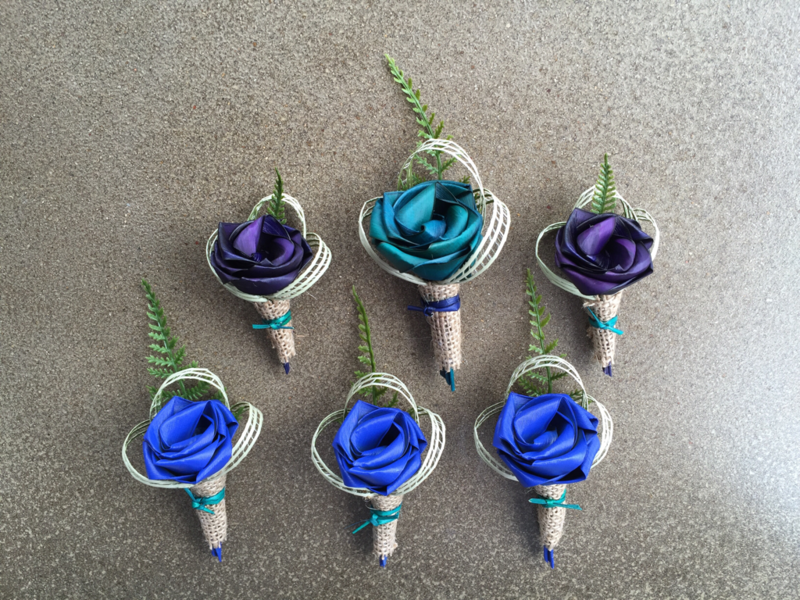 Bridesmaids seven flower posy $90 NZD & six flower posy $85 NZD in purple, turquoise & blue with green ferns koru & natural grasses. Buttonholes with grasses, green fern & koru $20 NZD ea. ​Top two buttonholes here are made smaller for the pageboys. 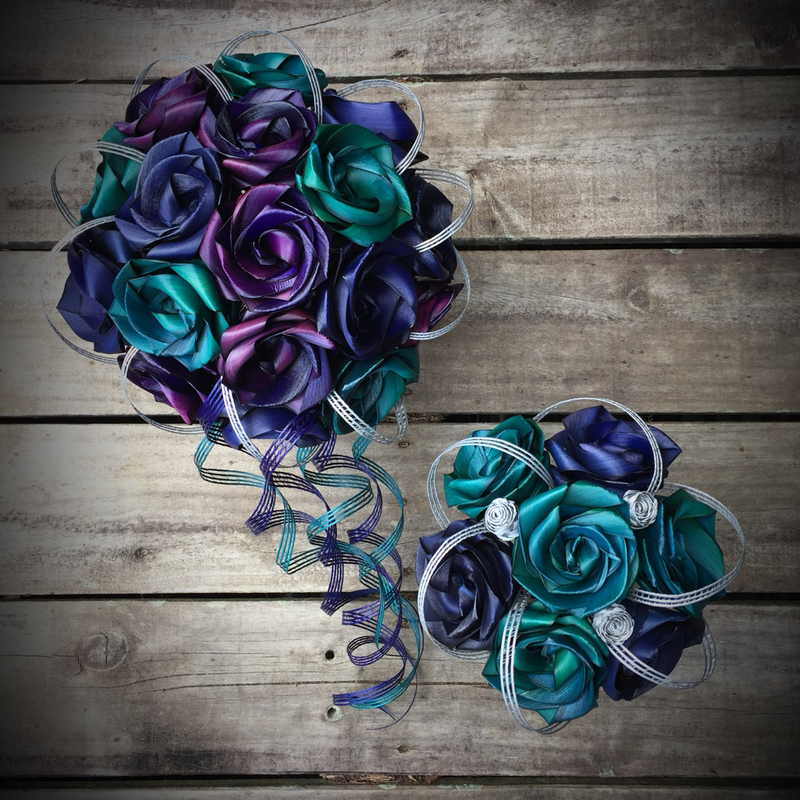 The classic round Paua bridal posy $190 NZD in purple, turquoise & blue with Paua pieces and silver loops around the posy. 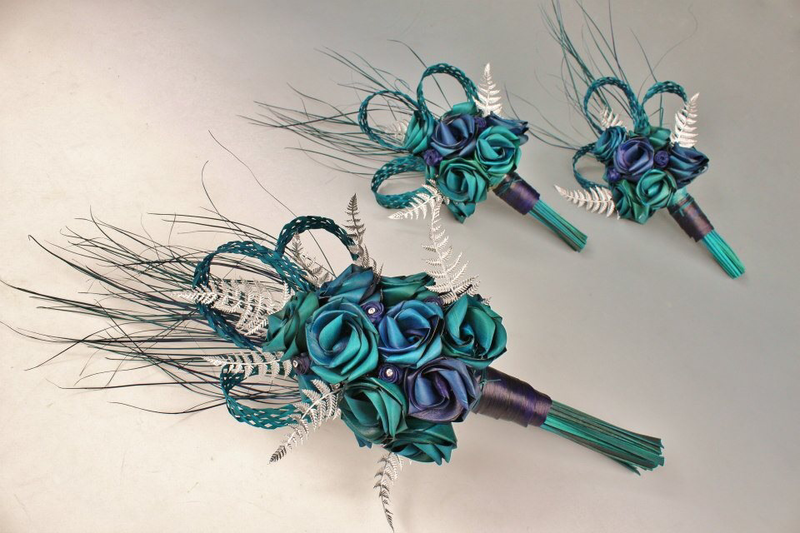 The stalks are wrapped in matching satin ribbon. 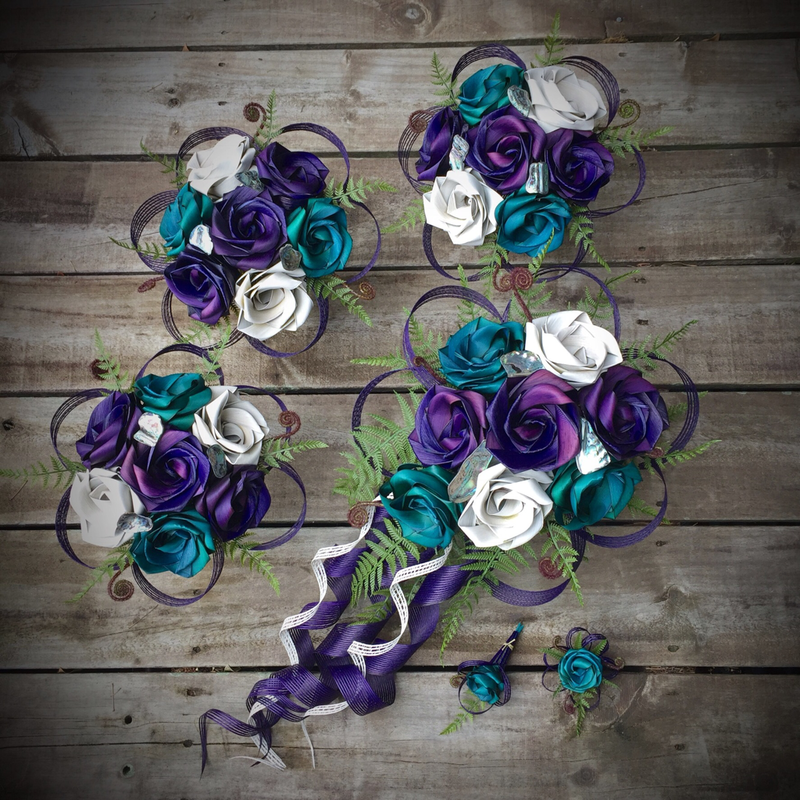 The purple is special for this bride & the bridesmaids have the turquoise & blue only. Bride $190 NZD & Bridesmaid $90 NZD. 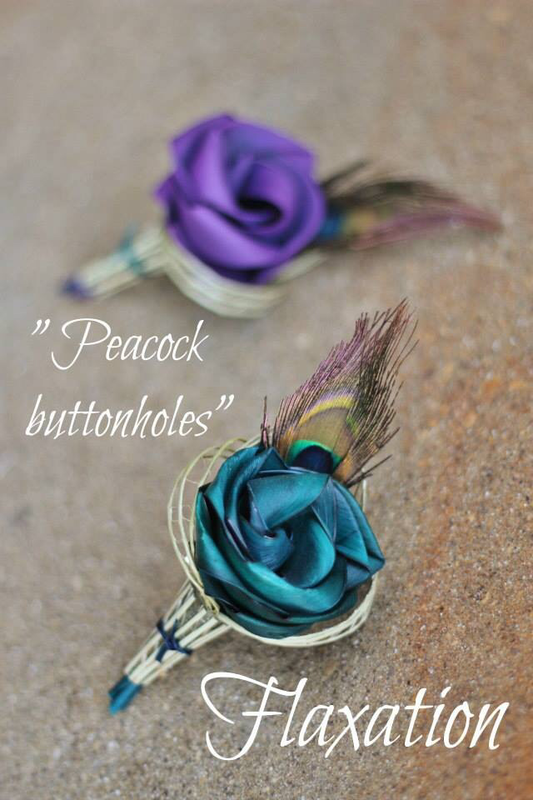 Multi coloured paua rose buttonhole $25 NZD. 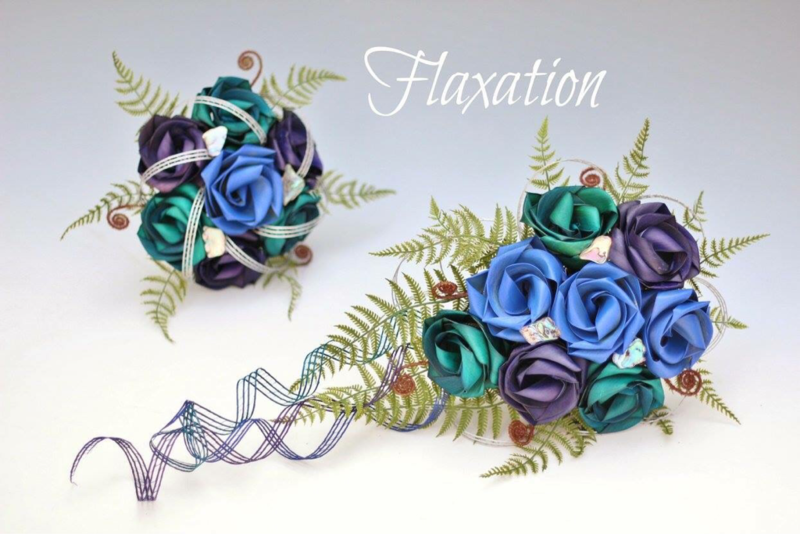 Three flower cake topper in purple, turquoise & blue with low loops & green fern $45 NZD. 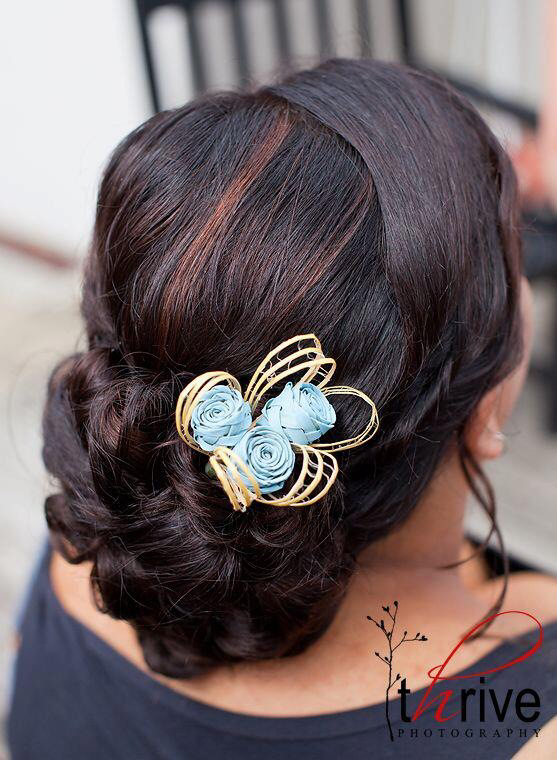 Three flower hair comb $35 NZD. Woven koru buttonhole in turquoise with silver fern $25 NZD. 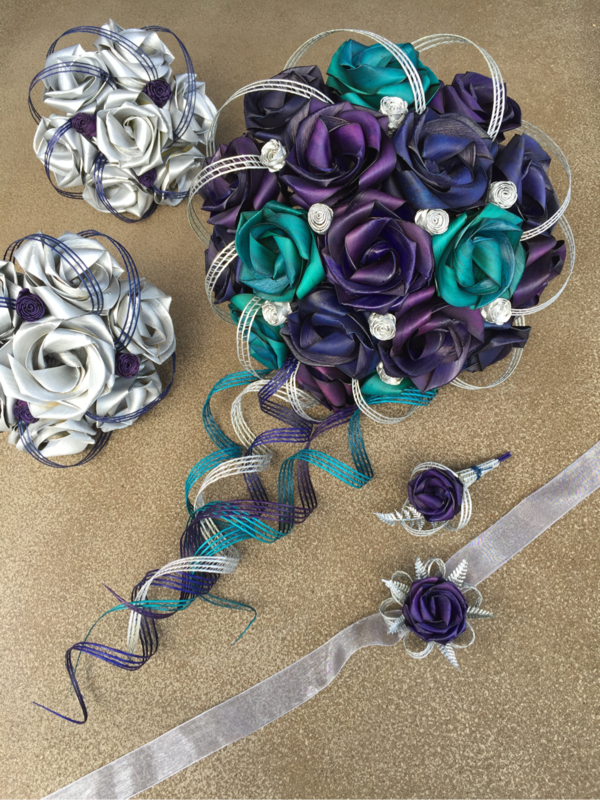 Large round posy in purple, turquoise & blue with trailing loops & tiny silver buds $190 NZD. Seven flower posy's in silver with buds & loops in Paua colours $90 NZD. 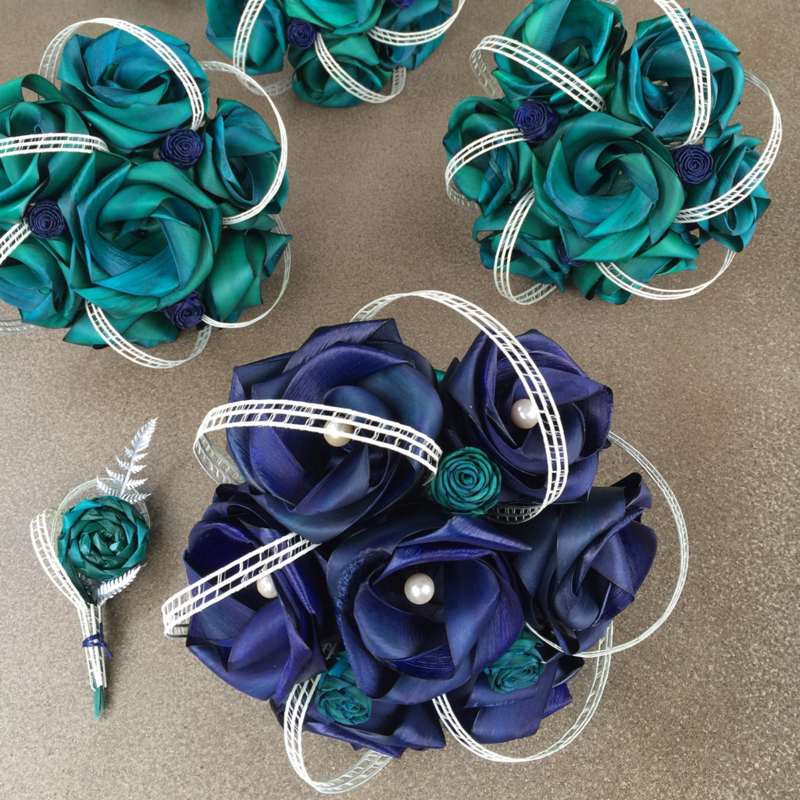 Wrist corsage $30 NZD & buttonhole $20 NZD. 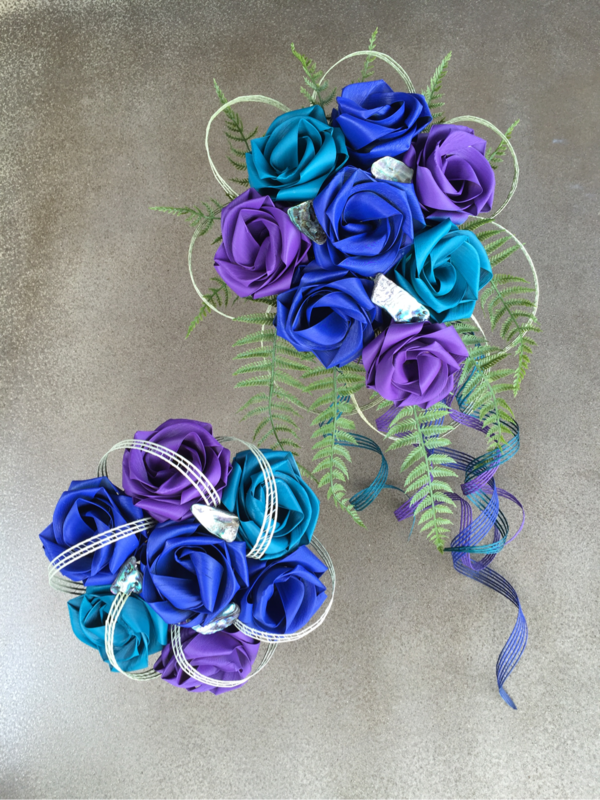 Three bud corsage in purple, turquoise & blue with silver loops & a Paua piece $25 NZD. 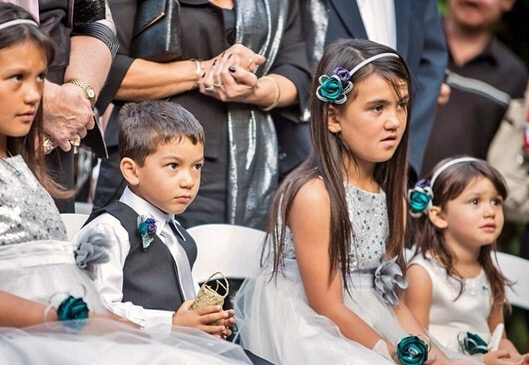 Flower girl petal basket $60 NZD each. 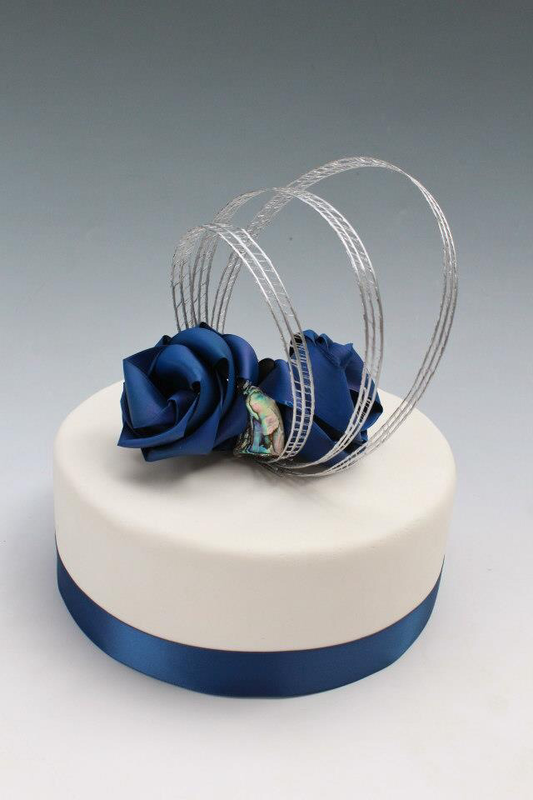 Paua cake topper with two vibrant blue flowers & high silver loops $40 NZD. Vibrant blue & turquoise posy with silver buds & loops $190 NZD. 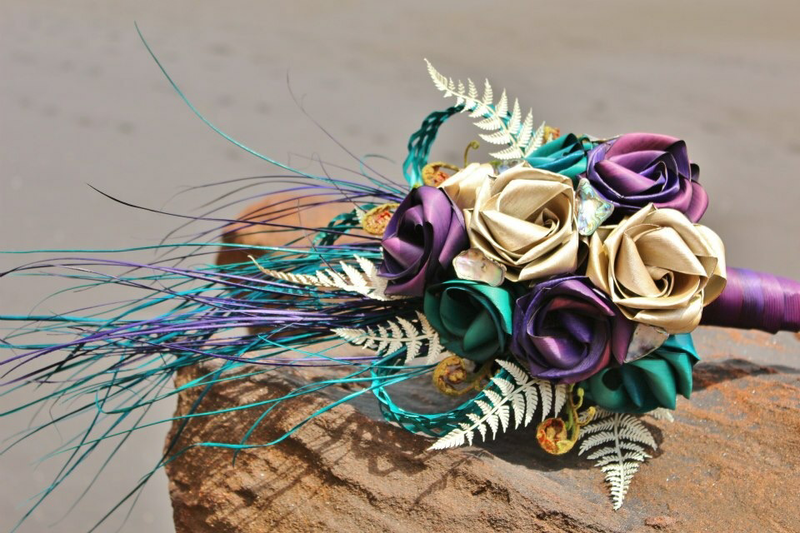 Cascading arm held bouquet in turquoise, purple & Ivory with grasses, woven loops, Paua, fern & koru $190 NZD. 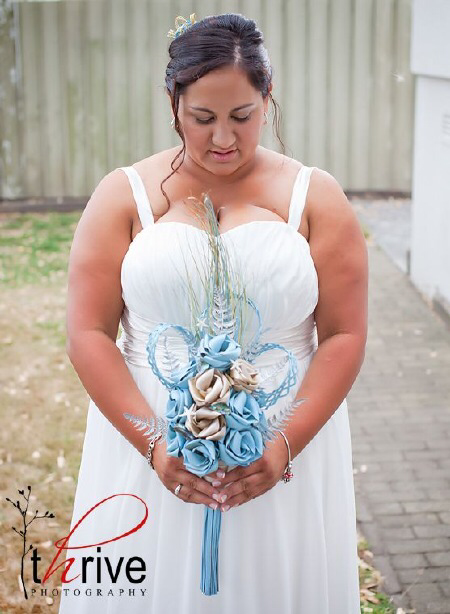 Brides blue seven flower posy with bridal pearls, turquoise buds & white loops $120 NZD. 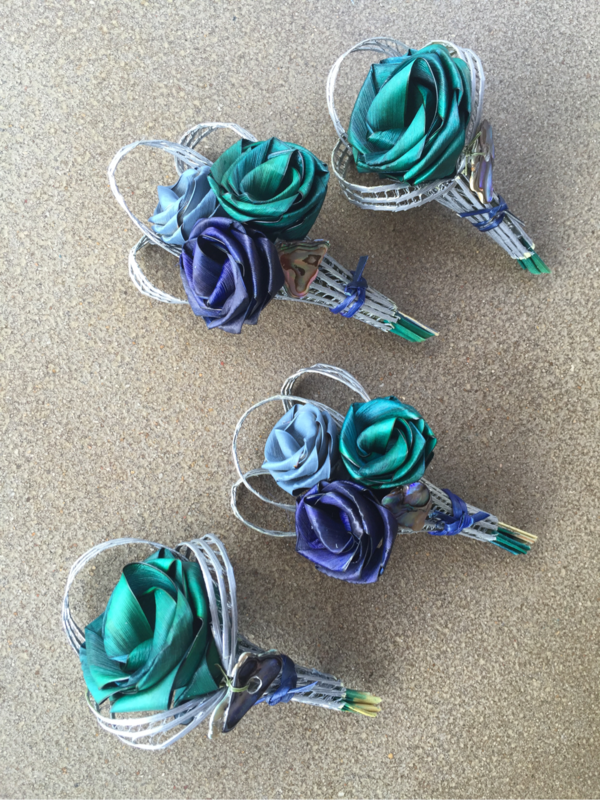 Bridesmaids seven flower posy in turquoise with blue buds and white loops $90 NZD. Single flower Paua posy with loops & Paua pieces $60NZD each. Seven flower paua posies $90 NZD each. 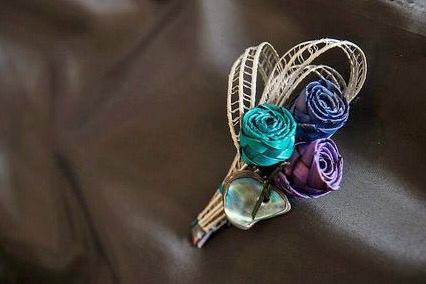 Single flower buttonhole with turquoise rose, silver loops & Paua piece $20 NZD. 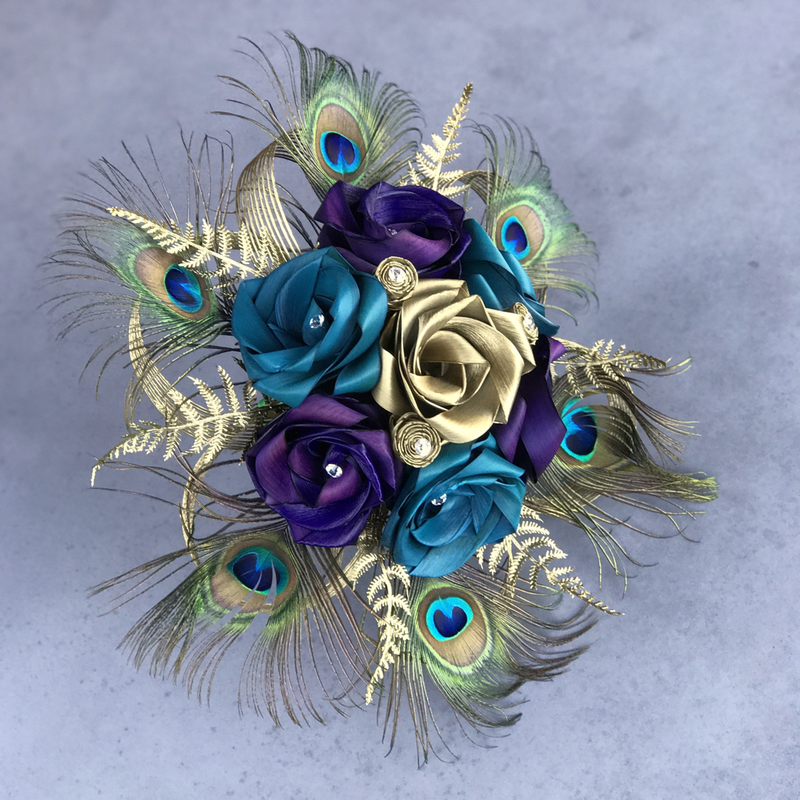 ​Three rose corsage with loops & Paua piece $25 NZD. 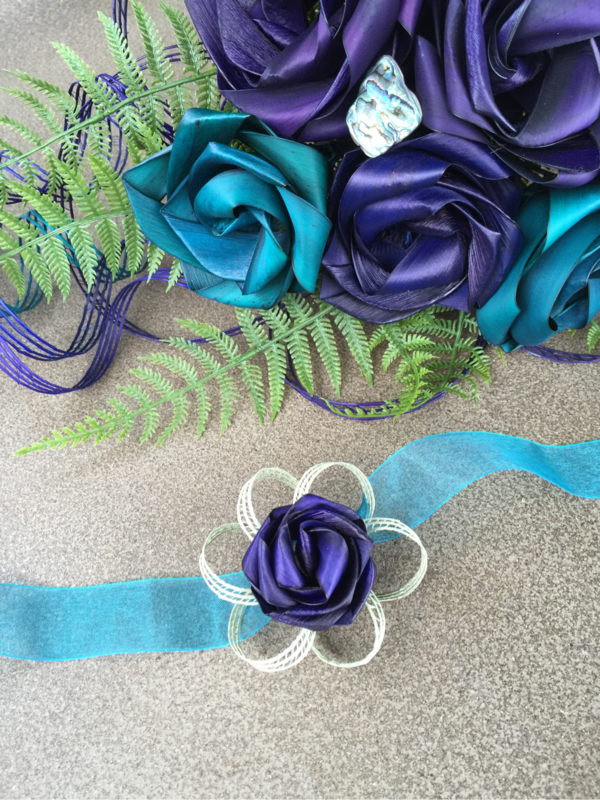 Wrist corsage purple rose with Ivory loops on turquoise organza ribbon tie $30 NZD. Headbands with two roses & loops $30 NZD. Wrist corsages $30 NZD. 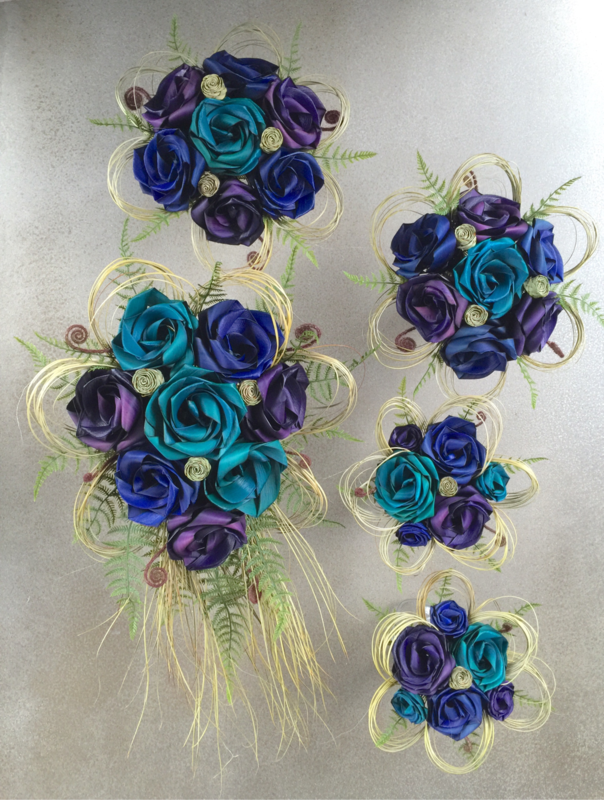 Brides waterfall bouquet $190 NZD & bridesmaids seven flower posy $90 NZD both in vibrant blue, turquoise & vibrant purple. Shown here with green fern & Paua shell pieces. 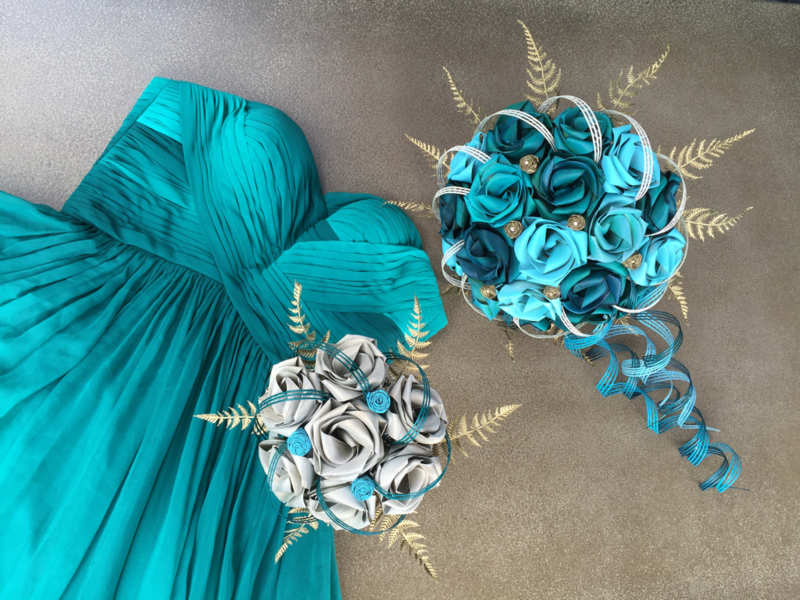 Teal, turquoise & Aqua large bridal posy with trailing loops, gold buds and gold fern $190 NZD. Seven flower bridesmaid posy in Ivory with Aqua buds, turquoise loops & gold fern $90 NZD. 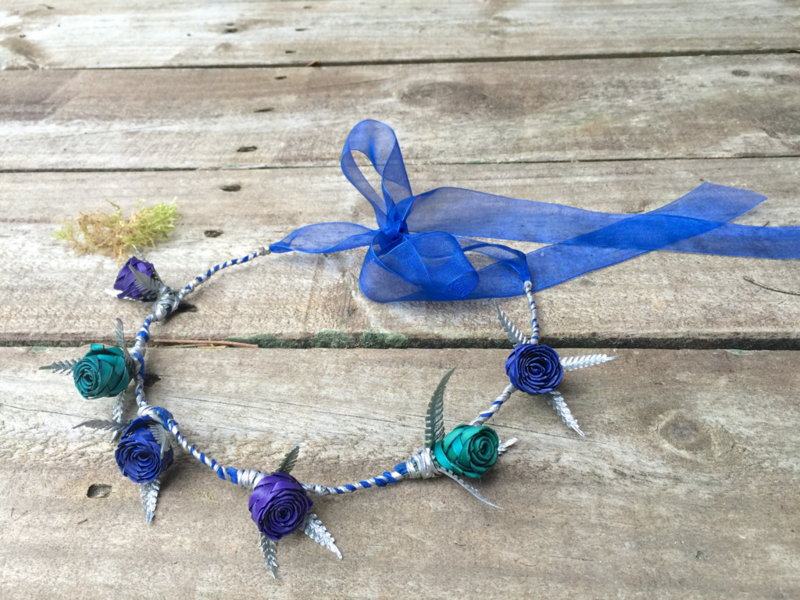 Brides seven flower posy in vibrant blue, purple & turquoise with Paua, fern & Koru $120. 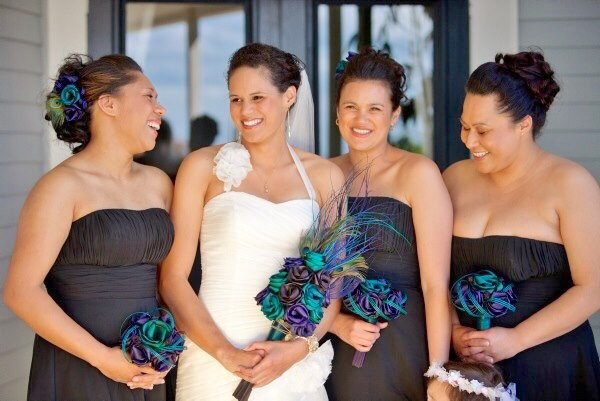 Bridesmaids Paua seven flower posy $90 NZD. 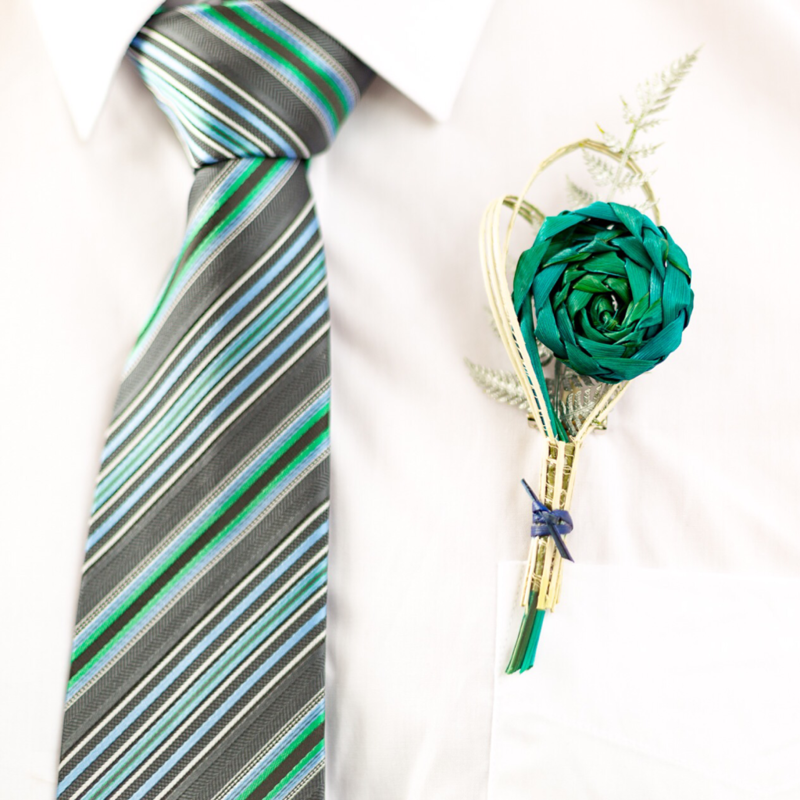 Looped buttonholes with green fern & hessian wrapped stalk $20 NZD. Fan style buttonhole in turquoise with fern, koru & Paua $20 NZD. Paua shell ring holder in turquoise $50 NZD. 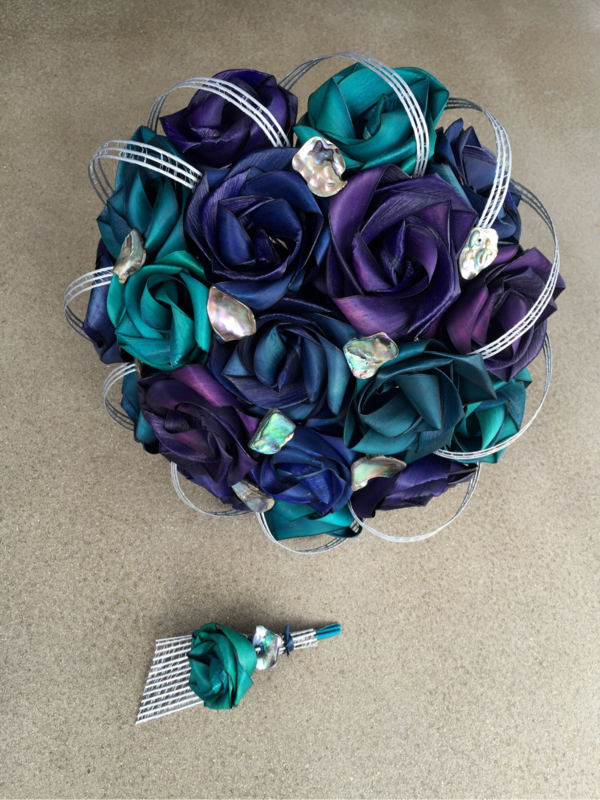 Brides waterfall bouquet in vibrant blue, turquoise & purple/blue with green fern, koru & Paua $190 NZD. 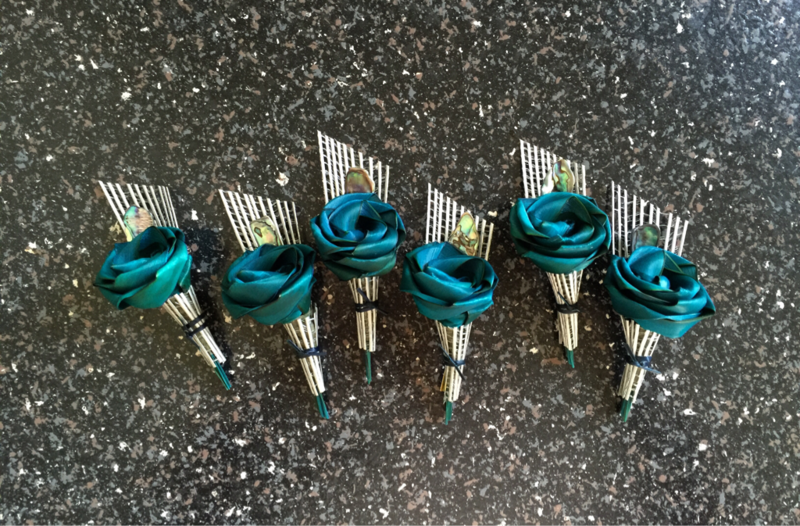 Bridesmades matching posy $90 NZD. 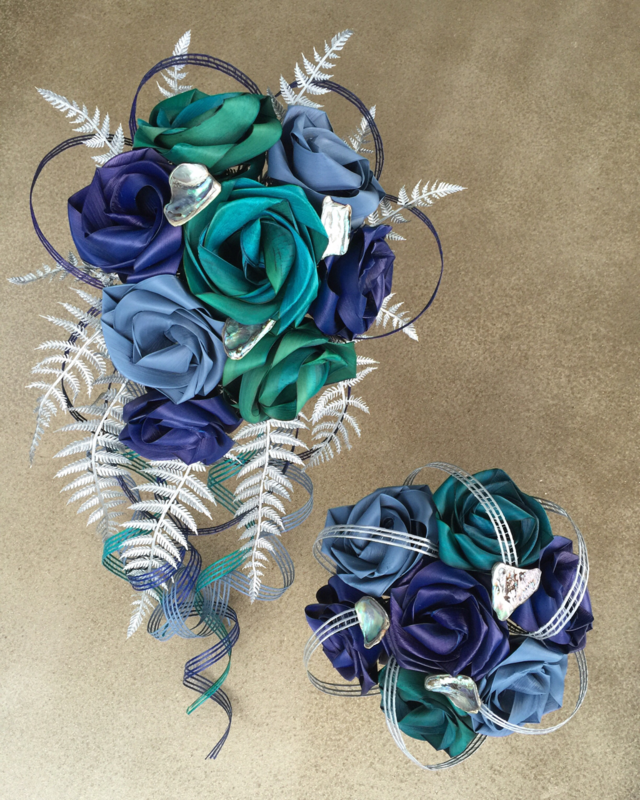 Cascading bridal bouquet in mixed blues $190 NZD & matching bridesmaids posy's $90 NZD ea. Our beautiful bride with her cascading bouquet. 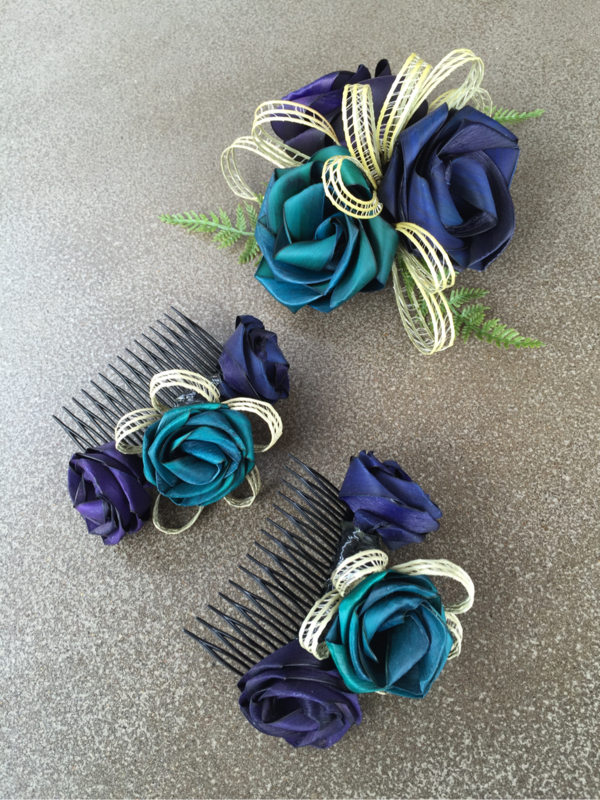 Three bud hairpiece on a bobby pin $25 NZD. 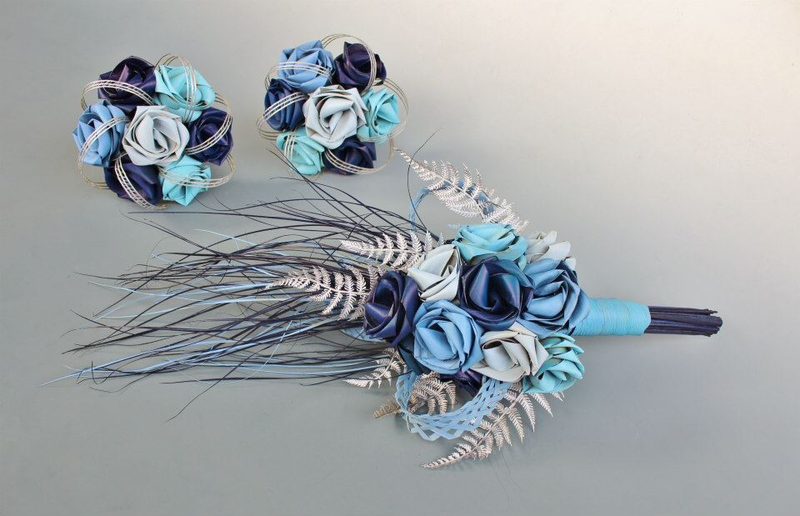 Cascading bouquets in turquoise & blue with silver fern, woven loops & grasses. 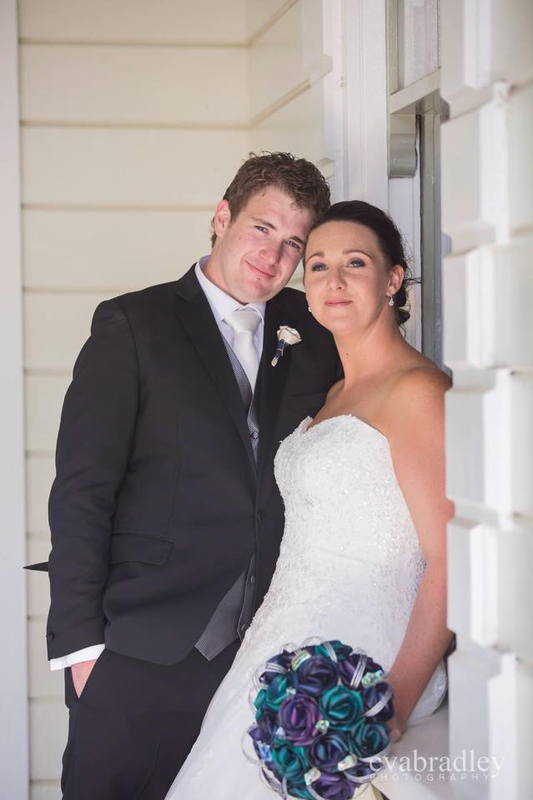 Brides $190 NZD & bridesmaids $100 NZD ea. The Peacock & Fern bridal posy $190 NZD. Our stunning clients with their peacock inspired pieces. 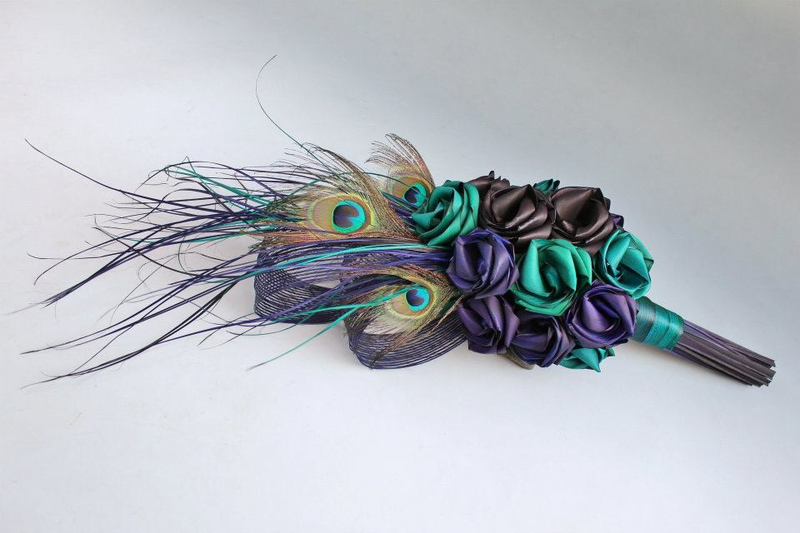 Cascading peacock bouquet in turquoise, purple/blue & black with grasses and netted loops $190 NZD. Brides seven flower peacock posy $180 NZD & three flower bridesmaids peacock posy’s $80 NZD each. 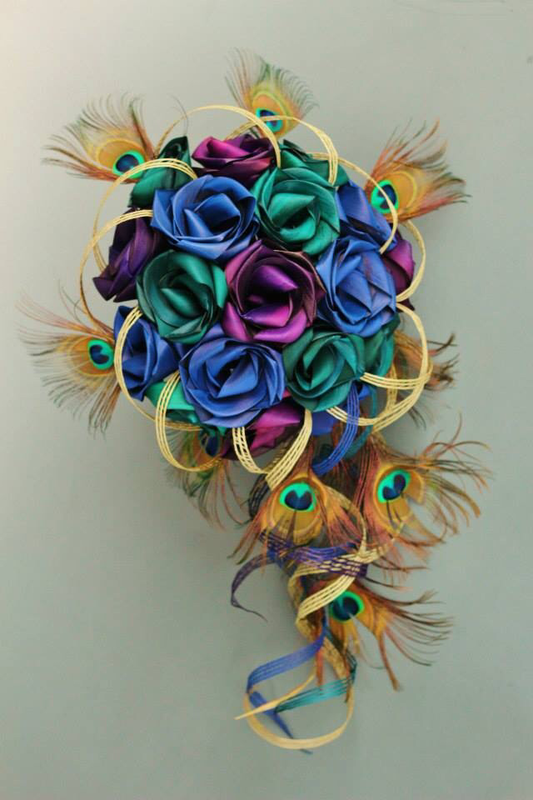 Large peacock bridal posy $220 NZD. Our beautiful clients with their peacock inspired designs. 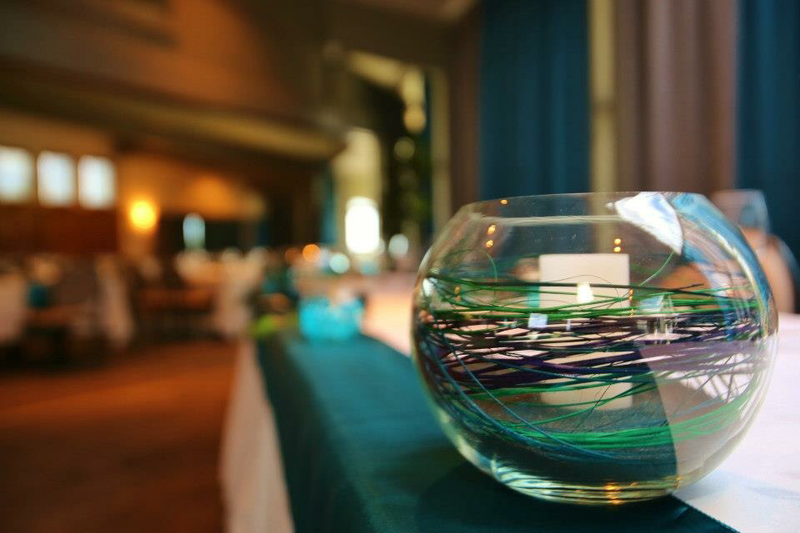 Coloured flax grasses used in these centrepieces with coloured sand & LED candle.